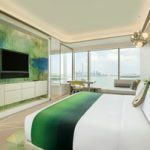 W Hotels Worldwide today announced the highly-anticipated opening of W Suzhou, the brand’s newest property in Greater China. Located on the banks of Jinji Lake in Suzhou, 90 minutes drive from central Shanghai, W Suzhou is within walking distance of bustling parks and top attractions along the lake’s edge. Owned by Suzhou Industrial Park Jinji Lake Urban Development, the hotel embodies a modern take on the city’s architectural heritage with a design story inspired by the region’s deep connection to nature. A new centerpiece of urban architecture and design in Suzhou, Jinji Lake is a modern high-design hot spot offering a contrast to the many nearby UNESCO World Heritage Sites that have attracted visitors for generations. The bustling social and commercial center of Jinji Lake was built almost entirely within the last decade and is now a magnet for businesses, high-end residential developments and jetsetting travelers. The design narrative of W Suzhou is inspired by the historic city’s UNESCO-listed classical gardens. Designed by Rockwell Group, the hotel highlights traditional and natural elements through the brand’s lens of vibrant design. These concepts are integrated into the hotel’s aesthetic, reinterpreting lakes, rocks, pavilions and gates as levitating elements woven throughout the hotel. At the porte cochere for example, guests are greeted by the “Crystal Cloud,” a dichroic acrylic and metal chandelier that simulates the subtle flow of clouds through changes in lighting and mist. The entrance of W Suzhou is amplified with contemporary interpretations of ancient Suzhou through modern art and design. A place to unwind and socialize, the Living Room (the brand’s take on the traditional hotel lobby) welcomes global travelers and locals to the up and coming destination with locally-inspired décor such as floating, pebble-like seats, which are inspired by the rocks in the classical gardens that Suzhou is known for. Additionally, walls feature photographic works of historic Suzhou alongside contemporary pieces – creating a mesmerizing interplay of classic and future Suzhou. With 379 guestrooms and suites, each of the hotel’s 11 room types feature elements of the city, and tie back to the overarching design narrative of levitation, with bathtubs, desks and beds all having the illusion of floating in space whist overlooking stunning views of Jinji Lake. 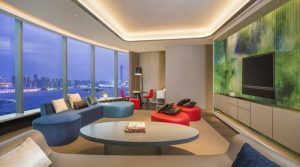 W Suzhou’s 45 suites, including two Extreme Wow Suites (each measuring 400 square meters), raise the bar on design and innovation for the entire destination. W Suzhou also features 60 serviced residences of one-, two- and three-bedroom units, available to rent for long-term luxurious living or stays of 30 days or longer with exclusive access to REZ, a dedicated lounge for co-working, socializing or just chilling out. Four distinct restaurants and bars provide epicurean thrills at W Suzhou, each featuring unparalleled views of Jinji Lake. An imaginative twist on Spanish classics lure guests into Suzhou’s first authentic Spanish restaurant, Toro Loco, located on the 37th and 38th floors with views of all three Suzhou lakes. Meanwhile the at Su Yan, the Chinese fine dinning restaurant, references to the local silk trade create a dramatically colorfoul immersive arrival experience. Once inside, Jiangzhe and Chaozhou cuisines are dished up daily, guaranteeing explosive flavor. Guests can also cozy up with all-day international favorites at the 220-seat The Kitchen Table. In attracting locals to mix and mingle, WOOBAR takes center stage at W Suzhou. Set to create a buzzing scene in Suzhou with a daytime lounge for more than 180 guests, the stylish curved design and bright natural daylight creates an ideal locale for casual business meetings and day-time socializing. By night, the space transforms into a vibrant cocktail bar, bumping to the eclectic beats from two DJ stages. Guests can enjoy a selection of specialty drinks at WOOBAR Garden, the outdoor patio, while reveling to the beat of the music in this seamless indoor-outdoor space. Guests can make a splash at WET®, Suzhou’s highest pool on the 36th floor, or get pumped up at the FIT gym equipped with the latest TechnoGym equipment including treadmills, cycling machine and boxing machines. The AWAY® Spa will pamper guests with Givenchy amenities, while the Detox Beauty Bar offers guests nutritious salad options, detox beverages and healthy mocktails, giving guests the energy to look good, feel good, go longer and stay later. Mixing work and play, W Suzhou offers state of the art technology in more than 3,500 square meters of meeting space, including top of the line conference and audiovisual equipment. Measuring more than 800 square meters, the Great Room sets the mood for nearly 900 guests and easily divides into three versatile spaces. Seven meeting studios adapt to any production, fueling inspiration with natural daylight and bold lake views. The outdoor venues OutOn4 Terrace and WOOBAR Garden are exquisite settings for chic cocktail receptions, accommodating up to 230 people combined.